David Rosand’s “Titian’s Presentation of the Virgin in the Temple and the Scuola della Carita” appeared in the Art Bulletin in March, 1976. * It would be hard to imagine a more thorough and better researched paper than this one by the late Columbia professor who during his long career became one of the leaders in the field of the Venetian Renaissance. In his essay Rosand proposed to “take a new look at Titian’s painting, to consider it on its own terms, the details of the composition as well as its broader contexts….” He examined the patronage, the social function of the picture, the position of the image within the history of its type, the relationship of the picture to its physical site, as well as the conditions under which it was to be seen. He stressed that he was departing from the traditional nineteenth and early twentieth century view of the painting as an example of Renaissance naturalism with little attention to its iconography. Rosand’s study is primarily iconographical. He demonstrated that practically every detail in the painting is important, and that all the details fit together to form a unified whole. In this brief review I would like to highlight some of the most significant iconographic details that Rosand explored as a guide to viewing the painting. I would also like to disagree with his analysis on one significant point. Titian’s painting is still in the place in which it was originally meant to be seen although the nature of the site has changed around it. Venice’s Accademia, its famous art museum, was originally the church of S. Maria della Carita, the home of the Confraternity della Carita, one of the leading social and charitable organizations in sixteenth century Venice. Around 1534 the confraternity commissioned Titian to do a painting of the Presentation of the Virgin for a particular wall in one of its rooms. The Presentation was a very popular subject in Renaissance Venice both before and after the Reformation. The subject was based on the legendary story of Joachim and Anne, the parents of Mary. Giotto had immortalized the story back in the thirteenth century on the walls of the Scrovegni or Arena chapel in nearby Padua. According to the legend the sacrifice of Joachim, a prosperous sheep raiser, was rejected by the priests of the Temple because he and his wife were childless, a sign of divine disfavor. Banned from the Temple, Joachim left his wife and went to live in the fields with his shepherds and flocks. However, he made an offering in the wilderness and not only was it accepted by God, but he was also told to return home to his wife, Anne, who had also been given a sign that they would be blessed with a child. They met at the Golden Gate of the city, exchanged a kiss, and Anne conceived and bore a daughter Mary. In thanksgiving the joyous couple resolved to offer their child to service in the Temple. 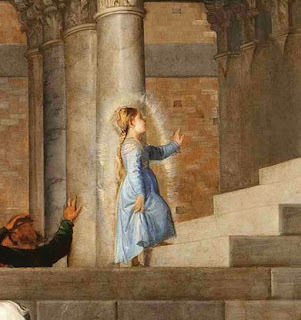 The offering of the child is the focal point of Titian’s painting although Titian depicts her ascending the steps seemingly on her own volition in much the same way that she appears to rise on her own in his earlier Assunta. Rosand noted that Titian surrounded the young Mary with “a full mandorla of golden light”, something unprecedented and full of meaning. In a section entitled “Dramatis Personae”, Rosand identified the various onlookers to the Virgin’s ascent up the steps of the Temple. ** He rejected the opinion of Vasari and others that these were merely portraits of contemporaries including Titian himself. 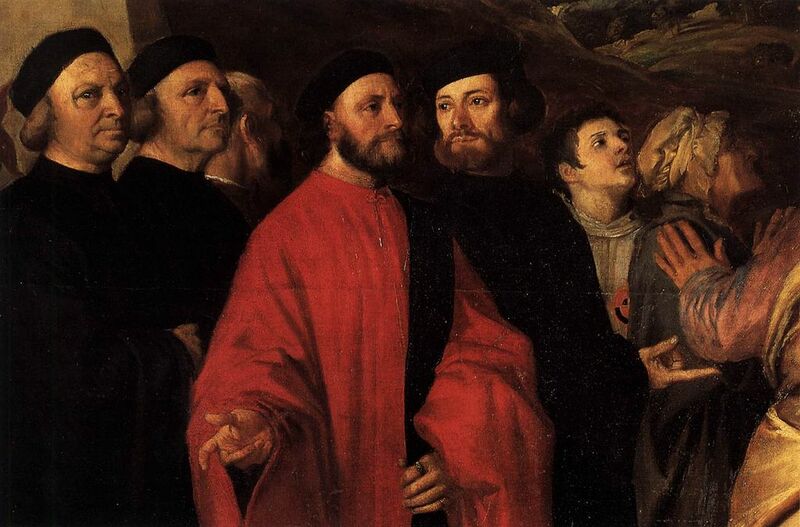 The main characters relate to the theme of the painting and derive from scriptural sources. Oddly enough Joachim and Anne, the parents of Mary, while centrally placed, are somewhat obscured. Joachim stands with his back to the viewer with his hand on his wife’s shoulder. Anne wears a little cap and certainly does not stand out as do other women in the painting. 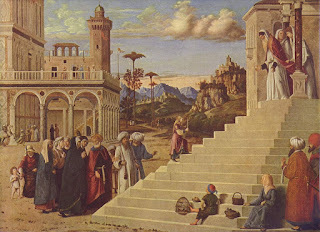 Rosand followed the lead of Leo Steinberg in identifying the beautiful young woman dressed in gold and white at the foot of the steps as Mary’s elder cousin, Elizabeth, the future mother of John the Baptist. Again following Steinberg’s suggestion, Rosand identified the younger priest at the top of the stairs as another major figure in the Infancy narrative, Zacharias, the future husband of Elizabeth. At the top of the stairs stands the second priest, receiving special focus by the upturned glance of the young acolyte; he too is in profile, but facing left. These two figures…are isolated as a couple within the composition, formally responding to one another across the distance of the staircase. 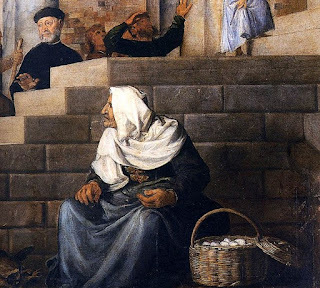 Finally, at the outset of his paper Rosand admitted that the old woman looking on besides the steps has perhaps been the greatest single mystery of the painting. He noted that most interpreters see her as a mere “pictorial detail” but argued that she represented much more. Panofsky had seen her as a personification of Judaism but Rosand was more specific. However, his description of the traditional appearance of Synagogue does not fit his explanation. Actually, the figure in black behind the two priests at the top of the stairs better fits the description of Synagogue. The egg-seller is old but her clothing indicates an elevated, even exalted status. Her gown is the same blue as the young Virgin’s and her head is covered with a white shawl that Titian had sometimes used in depictions of the Madonna. Rosand had argued that the gold and white of Elizabeth’s garments indicated her status but why ignore the garments of the old woman.? Cima da Conegliano in an earlier version of the Presentation, that is often compared with Titian’s, also clothed the egg seller in blue and white. I believe that the old woman could very well be Anna the Prophetess, who appeared in the gospel account of the Presentation of Jesus in the Temple. Scripture records that she had been a Temple denizen for years and it is not hard to imagine that Venetian artists would have wanted to also depict her attendance at the Presentation of Mary. It is true that she does not look at the young Mary ascending the steps. But her back is turned to the Temple and she looks toward or perhaps past the assembled figures who are also illuminated by the divine light that comes from the left. 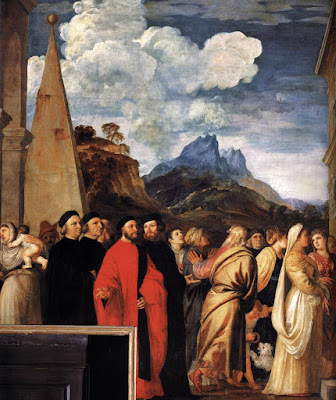 *David Rosand: Titian’s Presentation of the Virgin in the Temple and the Scuola della Carita. The Art Bulletin, Vol. 58. No. 1 (Mar., 1976), pp. 55-84.